Lifeline Syria and JIAS Toronto are proud to announce that they have been chosen as co-recipients of the Ve’ahavta Tikun Olam 2016 Humanitarian Award for their work in bringing Syrian refugees to Canada. Lifeline Syria, a leading community engagement initiative, was launched on June 17, 2015 [and incorporated as a not-for-profit in September 2015], in response to the ongoing humanitarian refugee crisis, to assist sponsor groups to welcome and resettle Syrian refugees as permanent residents in the GTA. Lifeline Syria continues to work with governments at all levels to help inform on policy decisions affecting refugees and newcomers. The organization is committed to helping Syrian refugees settle in Canada. JIAS (Jewish Immigrant Aid Services) Toronto is a government and community funded immigrant service organization providing comprehensive settlement services to 8,000 immigrants a year towards full social and economic integration. The organization is also a Sponsorship Agreement Holder (SAH) – the only Jewish SAH in Canada -with Citizenship and Immigration Canada (now IRCC) to sponsor refugees from overseas to come to Canada. JIAS Toronto has worked with 35 volunteer Constituent Groups to submit applications and support the refugee sponsorship process. In total, 40 applications have been submitted by JIAS Toronto to sponsor close to 140 refugees from Syria and Iraq. 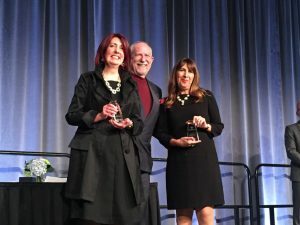 We are honoured to be a co-recipient of this award with JIAS Toronto. We believe it takes a community to meet the goal of resettling thousands of Syrian refugees as permanent residents and potential citizens in the GTA. To the individuals and corporate citizens from all walks of life, multi-faith, multi-ethnic and multi-cultural communities who raised money, and worked tirelessly in a sponsorship role to support resettlement of Syrian refugees. To the volunteers who provided pro-bono legal services, and who supported a host of other duties in providing private sponsorship opportunities to the Syrian newcomers. To the people, corporations and foundations that stepped forward and donated money, time and resources, to ensure that resources were there when the newcomers arrived. 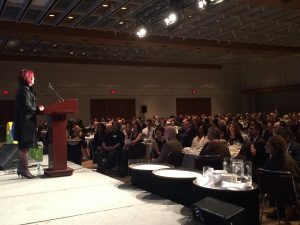 To our partners, including universities, colleges, corporations, Sponsorship Agreement Holders, settlement agencies, community organizations, representing the very best of Canada’s pluralistic traditions, that provided the means to register and sponsor Syrian refugees, and continue to support their successful settlement in Canada. To all three levels of government officials who stepped up and provided the leadership to open the door to private sponsorship possibilities for refugees. To the Lifeline Syria staff, management, directors and volunteers, past and present, whose passion and dedication to this work make this initiative possible. On behalf of the Board of Directors of Lifeline Syria, we thank you all.